Greener lawn in 1 week. Thicker tougher lawn. Kills weeds and moss. Watersmart formula which helps protect against heat, drought and other stresses. Covers 100m2.For a rich, green lawn, killing dandelions, white clover, plantains and moss with unique greening formula With high potassium to help build a thicker, tougher lawn and protect against drought and wear. Unique Formula, Best Greening Power* *EverGreen® Complete 4 in 1 has more nitrogen than many brands of feed, weed and moss killer, giving you the best greening power for your lawn. Makes the most of every drop! EverGreen® Complete 4 in 1 helps build a thick, green lawn with stronger roots which better absorb water and nutrients. This helps protect your lawn against heat, drought and other stresses. Why do I need to feed my lawn? Lawns need nutrients to stay healthy and green. 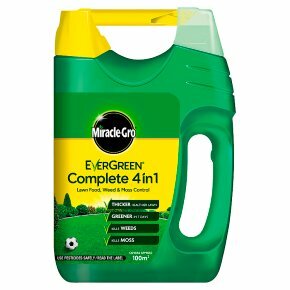 The most important nutrients are: N Keeps your lawn green and thick 14% nitrogen K Makes leaves strong and healthy 5% potassium oxide Why is EverGreen® Complete 4 in 1 the best? EverGreen® Complete 4 in 1 is a perfect all-in-one lawn treatment to feed, weed and control moss. Our unique nitrogen formula has been specifically designed to deliver the best greening power. We guarantee that your lawn will be greener and healthier in just 7 days! * Non-pesticidal use; claim not controlled by The Plant Protection Product Regulation (EC) No 1107/2009. Read all safety instructions before use. Instructions for Use For use only as a home garden lawn treatment. When and where do I use it? Use on lawns when weeds are actively growing. Apply between April and September when the weather is fair, the soil moist and the grass dry and frost free. When will I see results? After only a week your lawn will become a richer colour. The moss will blacken as it dies (any blackening of the grass is only temporary). After 2 weeks rake vigorously to remove and dead moss; the grass will then re-establish. Some weeds may grow quickly at first and then become twisted prior to dying. Expect to see full weed control results after 3-5 weeks. How do I use it? 1. Press down the yellow spout and slide back the green overcap. 2. Flip over the spout. 3. Walking at a brisk pace of 1.5m/second, invert the dispenser so that the spout points towards the ground and the granules flow freely. Maintain the spout at a comfortable height off the ground (at least 45cm). Spread across the lawn area in even strips. Avoid overlapping. When you stop walking raise the spout to stop the flow of granules. Maximum individual dose: 35g of product per square metre (1 oz per square yard). How much will I need? This pack treats 100m2 (10m x 10m). To determine the size of your lawn multiply the length by the width in metres. Alternatively a lawn with 6 by 5 standard fence panels (1.82m width), will cover approx 100m2. What about children and pets? Keep children and pets away from treated areas until granules have been watered in To Refill With the spout folded out in the spreading position, gently twist and lift off the entire spreader head. Refill, and replace the head securely before re-using. g. If eye irritation persists: Get medical advice/attention. Wear protective gloves.<br>Other general protection<br>Contains mecoprop-P. May produce an allergic reaction.<br>Environmental protection<br>Do not contaminate water with the product or its container.<br>Do not empty into drains.<br>Storage and disposal<br>KEEP OUT OF REACH OF CHILDREN. Keep away from food, drink and animal feeding stuffs. KEEP PRODUCT IN ORIGINAL CONTAINER, tightly closed, in a safe place. Dispose of contents / container to a licensed hazardous-waste collection site except for empty containers which can be disposed of in the dustbin. Contact your local council (local authority) for details.<br><br>Warning<br>Causes serious eye irritation.